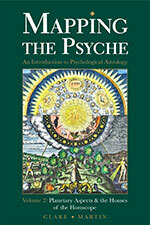 Mapping the Psyche is a three volume introduction to psychological astrology, based on the transcriptions of a course Clare Martin taught for many years at the Centre for Psychological Astrology. These books are an ideal entry point into astrology’s symbolic language, and are recommended for anyone with a serious interest in discovering how astrology can enhance self-understanding and promote psychic integration. Audience participation in these seminar style books ensures that psychological terms are fully explained and illustrated with personal examples. 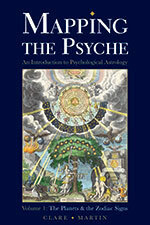 Clare draws from a variety of sources, including the perennial philosophy, alchemy and the kabbalah, demonstrating the inherently spiritual and magical dimensions of this approach to psychological astrology. In this book, a transcript of the first term of Clare Martin’s introductory course in astrology given for the Centre for Psychological Astrology, the basic building blocks of astrological language are presented, not in the dry, ‘cookbook’ manner which mars so many astrology texts, but in the lively and relaxed format of the classroom. Questions from students punctuate the teaching, making the material accessible, fluent and immediately applicable to everyday life. The reader is taken on a fascinating journey through the solar system, the ancient planetary gods and the energies and motivations symbolised by their astrological equivalents: and then through the signs of the zodiac, their elements and qualities, and the expression of the planets in each sign. The inclusion of the psychological dimension of human life, as well as the profound symbolism of alchemy as a parallel map of the individual journey, makes this a fascinating in-depth exploration which will expand the understanding, not only of the student with no previous knowledge, but also of the most experienced astrological practitioner. This book, a transcript of the second term of Clare Martin’s introductory course in astrology given for the Centre for Psychological Astrology, continues her clear, insightful and innovative presentation of the basics of astrological study. Exploring the planetary aspects and the houses of the horoscope, the ten lessons focus on the horoscope as a dynamic interweaving of polarities: the angles, the houses, and their related zodiacal signs are examined from the perspective of complementarity, and the enigmatic Moon’s Nodes are interpreted from a fresh and exciting perspective. 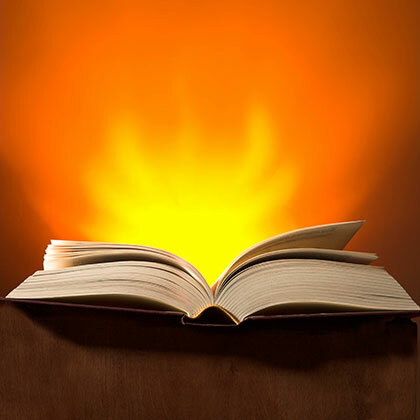 Major and minor aspects are illuminated by examples and group discussion, and the importance of a missing element or aspect is discussed with originality and depth. 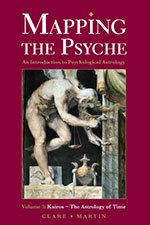 Volume 2 of Mapping the Psyche is a superb successor to Clare’s first volume on the planets and the zodiacal signs, and will provide solid groundwork for students taking their first steps in astrology, as well as deepening the understanding of experienced practitioners who can benefit from Clare’s beautifully structured, elegant and comprehensive approach. “As students of Clare Martin, and readers of her two previous books, will recognise, Volume 3 of the Mapping the Psyche trilogy, covering transits, returns, progressions and directions, is once again both immediately accessible and profound. A clear understanding of the quality of time, or ‘kairos’, offers the reader an opportunity to consciously align their lives with the movements of the heavens – to “do gladly that which I must do.” In this way, the book offers not only a crystal clear exposition of astrological mechanics, but a genuine ‘map’ for students to follow. It also excels as an invaluable reference source for experienced astrologers to cherish.” Teresa Early, Dip.Psych.Astrol. The books are available from Wessex Astrologer as well as Amazon and all good astrology bookshops.